Talk about a slippery slope. The difference between success and failure seems to be very thin sometimes, just as Enron was heralded as one of the greatest companies of the modern age, it was actually falling apart internally. Everyone on Wall Street, more or less, believed that Enron was nothing if not a juggernaut of the energy market with only success stories under its belt. At the same time on the inside, a sort of religious fervour drove employees to think that the rumours of failure in different business units weren't true. 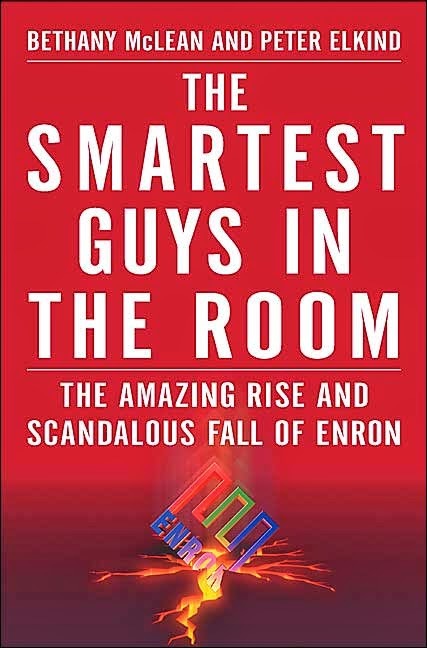 The Smartest Guys in the Room is a well researched timeline of everything and everyone that happened to Enron. Unfortunately, it is little else. If you are looking for the definitive account of what happened, look no further. However, if you would like to hear more about what was going on inside the heads of the now-convicted chief executives, you will find no answers. It is a fascinating story and an enticing read, but it also left me thinking about how management gurus like Jeffrey Skilling got so carried away. There is so much more at work here. Of course, The Smartest Guys was written in the aftermath of the bankruptcy and therefore might lack some of the contemporary insight. Especially since the 2008 financial crisis, I bet that there would be some very interesting connections to be made. They say that power corrupts, and time and time again it has also been shown that absolute power corrupts absolutely. This is true of both Enron executives and bank executives alike (like the ones in Too Big To Fail). As I well know, business studies tend to focus one-sidedly on the success stories of the current era. The Smartest Guys in the Room is the complete opposite: a wonderful story of everything that can go wrong in business.